Here is the post everyone has been waiting for, right ? Photos and talks of food in Tokyo. Here we go. Fruit is also not a common thing to eat, being extremely expensive, more of a treat or a gift to make. Getting back to gluten, it is also found in their « tempura » dishes, where meat (pork being a favorite) is covered in a batter and then deep-fried. I had such a tasty dish on two occasions, the first time was digested fine… but not so the second ! The food always comes with a small side dish of pickled vegetables as well as very thinly shredded raw cabbage, to be drizzled with yuzu dressing. Yuzu is a citrus fruit, something between orange and lime. It imparts a slightly sweet flavor to the dressing and makes the cabbage taste very good. 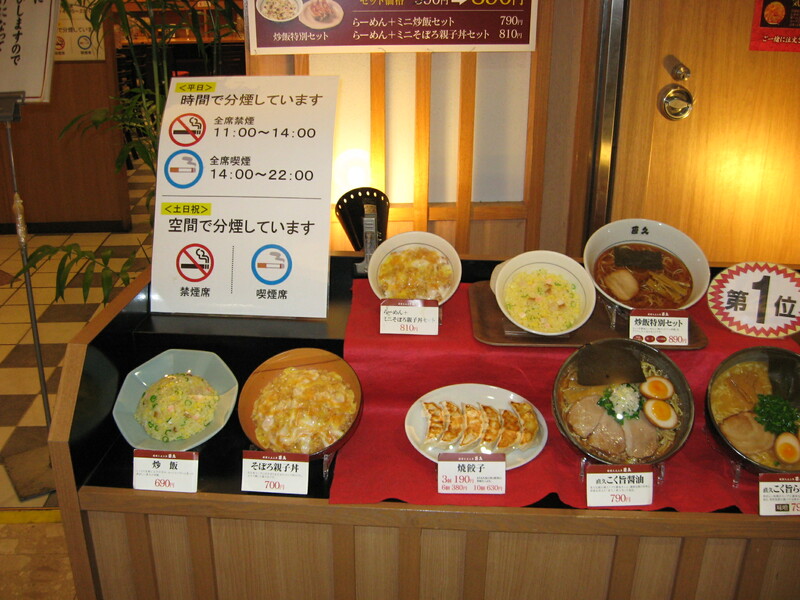 A bowl of miso soup is also served with the meal; its taste varies from one restaurant to the next. The fun part is fighting to grab the tiny tiny clams with your chopsticks at the bottom of the bowl!!! Now look at the next (fuzzy) photo – now this was my best meal ! This is « unagi », the famous eel dish ! The eel is grilled and placed on a bed of rice. I have already mentioned it, I know, but let me tell you, rice in Japan is really, really good ! Nothing can compare. And the eel just melts in your mouth. Am I starting to sound a little biased? Sorry ! As for some of the other delicious things we ate, one time we had an interesting warm savory custard with shiitake mushroom, which I would love to recreate. We also had some beef, not the famous Kobe meat, but still incredibly tender. It was served basically rare and already sliced. All we had to do was pick up the slices with our chopsticks – by the way, I have been practicing every week since we came back : a promise I made my daughter-in-law’s mom ! Do you know they sell « training chopsticks » for little kids, and even adults ? They come with rings where you place your fingers so they don’t move ! I discovered an interesting condiment. Because of its green color, at first I thought it was matcha tea. Not so. It is called « sansho pepper », and has a very pleasant smell to it. Green tea is systematically served as you wait for the meal, and your cup gets refilled by the waiter as you eat. This is when you get to practice saying « arigato gosaimas », not forgetting the sight bow of the head ! We didn’t have any sake, but we did see some sake barrels at the entrance of a shrine, gifts from the sake distilleries. Colorful and pretty, aren’t they ? However, I got to try something called « amazake », also made from fermented rice, but without any alcohol and drunk hot : it tasted like baby porridge with very soft rice grains, and honey sweet… To be enjoyed on a cold winter’s day outside a shrine! Even with this type of food, you could tell everything was super fresh… No preservatives, no allergies ! I am sorry I didn’t take more pictures of what we ate, but on a couple of occasions we were with other people and I didn’t know if it would be rude to get my camera out. Well, dear neighbors, let me conclude this post on eating out in Tokyo with a few pictures taken in a museum, of ancient Japanese cookbooks. I’ll be back soon with not-so-exciting, gluten-free recipes, but still with the same desire to share with you… So long ! Well this Dear Neighbour is jealous. Though if I went to Japan I might have to subsist on rice and hope alone. Still I can live vicariously through your photos which look wonderful, it really must have been a wonderful trip. Take care, and keep taking photos of your own world, I love it!